We had the opportunity to review Linguistic Development through Poetry Memorization by the Institute for Excellence in Writing (IEW). Free verse, haiku, name poems and sonnets are just some of the different types of poetry your child may come across in their studies. Poetry has managed to slip its way into our school over the years through the language arts program we have been using. My children have enjoyed reading, interpreting (the mystery) and memorizing them (competition). This has been something they have been doing since early elementary. Before I continue, I must say I love IEW everything as well as Andrew Pudewa. We saw him again recently at a homeschool convention. My daughter (the other writer) also had an opportunity to talk with him and she is just as smitten. Yes, we’re Pudewa groupies! 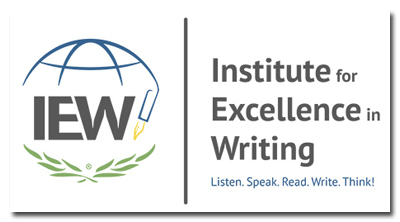 One of the reasons I love IEW so much is because they create curriculum that I, as a writer with a B.A. in English, would create (if I were that capable) to teach writing, grammar, poetry and more. Linguistic Development through Poetry Memorization is a complete program that introduces children, as young as kindergarten and through the twelfth grade, to great poetry and the skill of memorized language. It is also a program that English language learners and special needs students may use. When we do study poetry outside of our regular school day, it is usually during our family reading time. We used the program in the same manner, but my children did also spend time daily studying the poems. 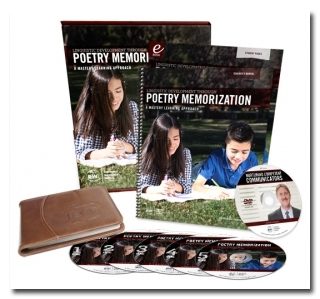 We received the Linguistic Development through Poetry Memorization set, which includes CDs in a very attractive case with all of the poems recited, the teacher’s manual and a PDF of the student pages. Also included is access to MP3 downloads and a DVD copy of Nurturing Competent Communicators. If you have not seen that before, you should watch it. It’s excellent! The recording is also available on YouTube. The physical items come in a box for easy maintenance and storage of the program materials. IEW graciously gave me a physical copy of the student pages, which is spiral bound and not included in the set. You may purchase it separately if desired. Level One: The Little Man Who Wasn’t There by Hughes Mearns. My Shadow by Robert Louis Stevenson, Who Has Seen the Wind by Christina G. Rossetti. Level Two: Rebecca Who Slammed Doors for Fun and Perished Miserably by Hilaire Belloc, God and the Soldier by author unknown and The Charge of the Light Brigade by Alfred Lord Tennyson. Level Three: A Young Lady Named Bright by Edward Lear, Grandfather’s Clock by Henry Clay Work and The Destruction of Sennacherib by Lord Byron. Level Four: Metaphysics by Oliver Herford, The Quality of Mercy by William Shakespeare and An Overworked Elocutionist by Carolyn Wells. Level Five: On the Eve of the Spanish Armada by Elizabeth I, Give Me Liberty by Patrick Henry and We Shall Fight on the Beaches by Winston Churchill. There are 96 poems and speeches with each level containing enough poems to learn over the course of one year. In Level Two and further, poem reviews of the ones learned in previous levels are included. We started in Level One, which are shorter poems and ones that would be great for interpretation and memorizing by a younger child. IEW does give the teacher a schedule suggestion and two things that are stated are to work at the child’s own pace, but practice daily. Although the levels are scheduled to be completed one year per level, your child may memorize the poems at a faster rate, so don’t hold him back. My children remember EVERYTHING and memorize very well. We started with listening to the CD together of the first few poems. This was very helpful to me and my younger son, because he was able to listen to the CD when I was not able to read the poems through with him. The CDs gave him a bit of independence with his study. My older two eventually went off on their own and used only the student book to read over and practice the poem(s) they were learning. My older two seventh and sixth grades will be receiving their certificates of completion for Level One soon. It has been a friendly competition between the two of them to see who can memorize the most (and the fastest). My youngest, third grade, is close to halfway through Level One. He has enjoyed coloring the illustrations on the poem pages. Along with memorizing the poems, all three of my children had very interactive interpretations of each poem. Some of the interpretations became group theatrical performances. It has been very entertaining. All I can say is at least they understood what the poet was trying to convey. If your child starts at Level One, he will have a memory bank full of writings by great poets and authors by the time he completes the program. Linguistic Development through Poetry Memorization introduced some new poets to me. I like that my children are being introduced to other poets that may not be as familiar to most. I think one special key to the Linguistic Development through Poetry Memorization is offering the poems read on CD. That makes it possible for the children to listen to the poems at any time; while riding down the road in the car, while they are creating with building blocks or painting a masterpiece. It is just like listening to music and memorizing the lyrics of a song. It is amazing how much or quickly they absorb what they are hearing (remember, that goes for everything). At least now, the words in their heads are containing more quality content and are ones that will stay with them for life. Even to this day, my children still remember poems they learned years ago. You may purchase the Linguistic Development through Poetry Memorization [Teacher’s Manual and CDs] for $65. You can read more reviews of this item by fellow crew members. Carla Link on Parenting Made Practical: Dating, Courting & Choosing a Mate… What Works?